Continuum is no Walking Dead juggernaut when it comes to ratings. But that doesn't mean that it's not worthy of your attention. 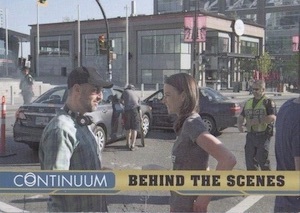 The science fiction-procedural drama hybrid returns with a second set of trading cards in the form of 2015 Rittenhouse Continuum Season 3. Besides covering the show's third batch of episodes, boxes come with three autographs. 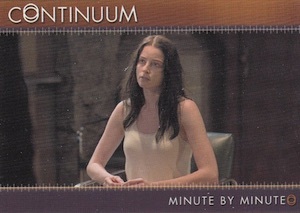 The 2015 Rittenhouse Continuum Season 3 base set has 60 cards. These means detailed looks at the 13 episodes as well as lots of character biography cards. Each card has a serial numbered Gold parallel. The product has more than 25 different Autograph signers encompassing much of the main cast. Rachel Nichols, Victor Webber, and Erik Knudsen are among the lead stars with signatures. Most of the big names signed previously for the Seasons 1 and 2 release, but these come with a different design. The first set was also extremely limited so it offers a second chance for those who may have missed out. 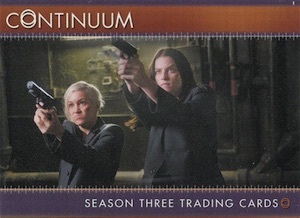 2015 Rittenhouse Continuum Season 3 has a pair of basic inserts as well: Star Cards (seven cards) and Quotable (18 cards). The only memorabilia card in the product comes as a two-case incentive. 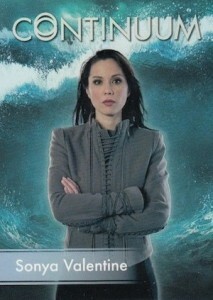 The Relic Card comes with a swatch of Kiera's black Polymeric Nano-suit, one of the key pieces of clothing in the show. 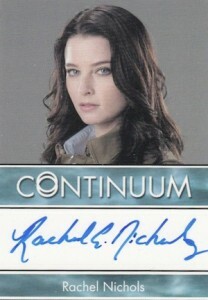 A Rachel Nichols Silver Signature Autograph is the four-case incentive. Those ordering 12 case of 2015 Rittenhouse Continuum Season 3 get an Archive Box that includes an exclusive Nichols autograph. 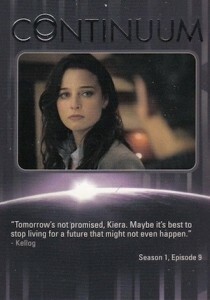 Continuum Season 3 Autograph Card Rachel Nichols as Kiera Cameron Silver Sig. 41 cards. Inserted 1:8 packs. All autographs are listed as Extremely Limited. EL = 200 or less copies. Given for ordering specific amounts of cases.